The IceCube Neutrino Observatory is a giant telescope embedded deep within the South Pole ice – a trap waiting to detect elusive astrophysical neutrinos. These neutrinos have traveled from violent, often explosive astrophysical sources all the way to the Earth without interacting with another particle. Many of these neutrinos will pass straight through the Earth and out the other side without leaving a trace. 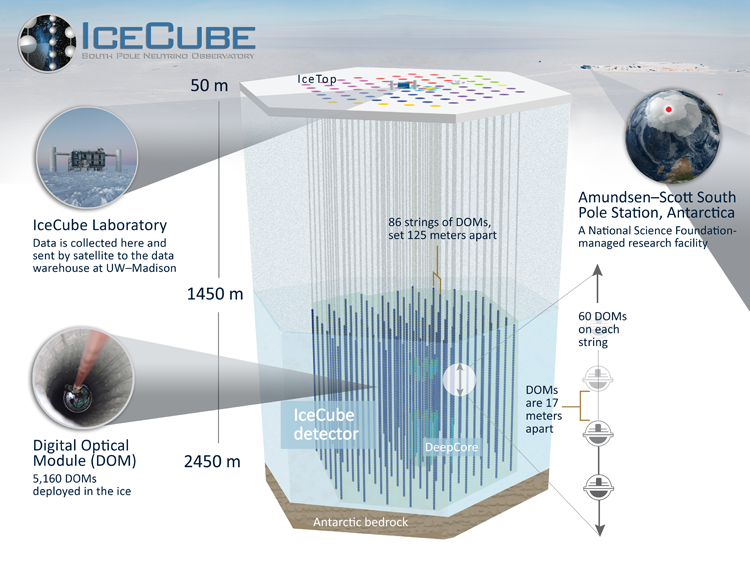 However, the strings of detectors inserted a kilometer deep into the Antarctic ice that make up IceCube (Fig. 1) can detect the radiation produced by rare neutrino interactions and, in fact, the IceCube collaboration announced the first ever detection of astrophysical neutrinos back in 2013. (Check out this astrobite on their discovery!) The origin of these particles, however, remains a mystery. Fig. 1. The IceCube telescope consists of thousands of detectors attached along strings embedded within a cubic kilometer of Antarctic ice. Active galactic nuclei and gamma-ray bursts were early favorites for the origin of the IceCube neutrinos, but one by one potential sources have been ruled out. Today’s paper eliminates another top contender, further deepening the mystery. Star-forming galaxies (SFGs) host constant collisions between energetic cosmic rays and interstellar gas. These collisions produce unstable particles called pions. Pions live for tiny fractions of a second before decaying into more sturdy particles, like neutrinos. Along with these neutrinos come a similar amount of energetic gamma-rays. Observations of the gamma-rays can therefore support or, as the case may be, undermine the argument that SFGs produce the IceCube neutrinos. Gamma-rays observed by the Fermi Large Area Telescope can be divided into two categories – those that can be traced back to a particular source, and those that make up a diffuse fog of gamma-rays with no particular known origin. Many of the diffuse gamma-rays come from point sources too faint to be individually resolved. In order for SFGs to be a valid source of IceCube neutrinos, they must produce a significant fraction of these diffuse gamma-rays. However, recent studies of the diffuse gamma-ray background suggest that blazars make up at least 72%, leaving little room for SFG gamma-rays. In today’s paper, Keith Bechtol and his collaborators predict the maximum number of neutrinos that could be produced by SFGs without violating the limits on the gamma-ray emission. 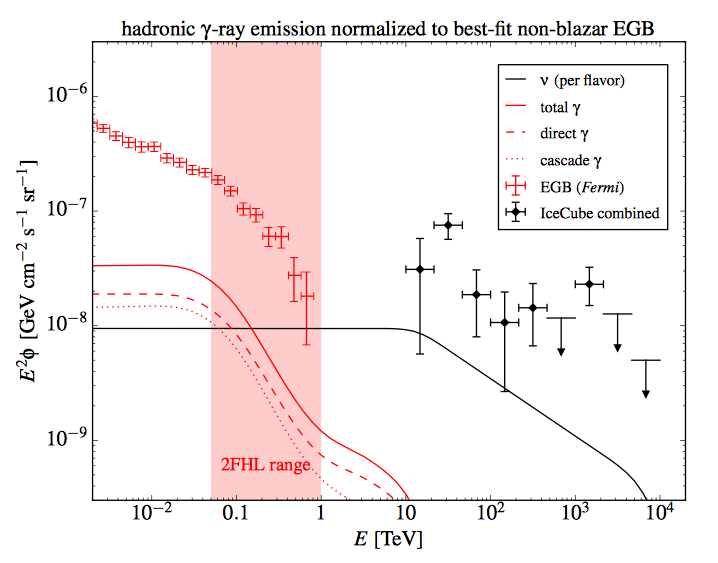 Figure 2 shows that even with the maximum allowed gamma-ray emission, SFGs just are not going to produce enough neutrinos to account for everything we are seeing in IceCube. Fig. 2. The constraints on the gamma-rays emitted by star forming galaxies (red line) limit the neutrinos these galaxies can produce (black line). The IceCube neutrinos represented by the black points lie significantly above the black line, still unexplained. Source: Figure 4 from the paper. So, one more promising source is eliminated, narrowing down the options, and pushing more and more unexpected possibilities to the forefront. Other recent work on the origin of IceCube neutrinos suggests that perhaps radio galaxies can explain both the IceCube neutrinos and the remaining piece of the diffuse gamma-ray emission. Others claim that we have acted too quickly in ruling out SFGs – perhaps more complex modeling of the particle interactions within these galaxies will allow for some of the gamma-rays that must be produced to be quickly absorbed, escaping our detection. Continued analysis and larger datasets will someday reveal the answer to this mystery. It is already exciting, however, that we are beyond the realm of expected answers. New observations always reveal the unexpected.